Give the gift of comfort this holiday season with this Anywhere Travel Neck Pillow from Comfort Ideas! Let’s face it, although we all love the time we spend with friends and family at holiday gatherings, travel can leave us exhausted, sore, and stressed. 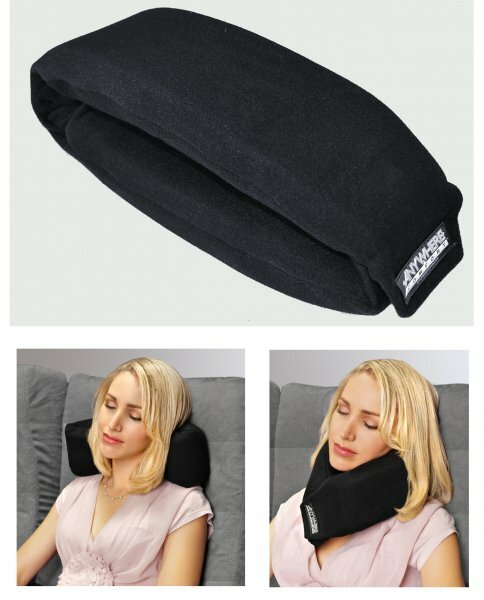 Now you and your loved ones can arrive relaxed and refreshed with the Anywhere Travel Neck Pillow! This neck pillow is uniquely designed to provide comfort and support during those long holiday trips. While many travel pillows are difficult to maneuver and keep in place, this neck pillow can be connected in a loop around your neck so that it stays right where you want it. It is completely adjustable and can be placed in a variety of sizes and shapes for added comfort as well. Made from high density Memory foam that is designed to conform to the shape of your body to ensure maximum comfort. It can be rolled up compactly and locked into position to fit in any bag or travel case. Packaged with a nylon cover to protect the surface of the pillow and maintain its quality. Perfect for car or airplane travel.